The Goodwin family meets Elijah for the very first time. Want to Make the World a Better Place? One Big Sandy Family Lets Their Actions Speak for Them, BIG SANDY, December 13, 2008 - On October 24, 2008, Flight United Airlines 896 touched down at Chicago's O'Hare Airport at 2:20 pm. At that moment, Elijah John TongSu Goodwin became an American citizen. Originally, Elijah's name was Su Ding Tong (Happy Childhood). The compassion shown by one Big Sandy Family all but ensures a better childhood than Elijah would've had if he'd stayed in China. When flight 896 touched down, Elijah Goodwin's citizenship changed from being a Chinese National to an American Citizen. Elijah was born in China with a clef lip and a clef palot. 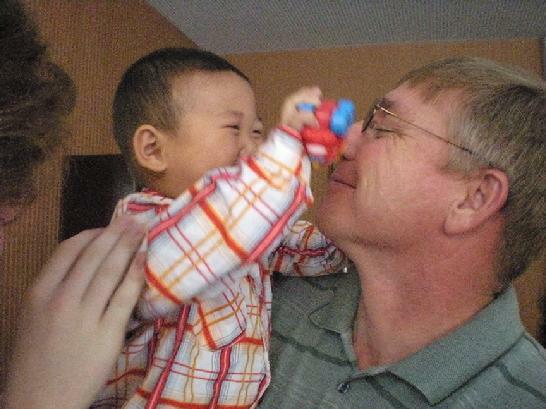 In China, Elijah was abandoned by his mother and left in an orphanage. Because of Elijah's special physical needs, what was a bright and happy child would've been permanently pushed aside into a future of uncertainty and societal rejection. In steps Glen Goodwin, Wife Colleen, Daughter Laurel, and Son Jesse. 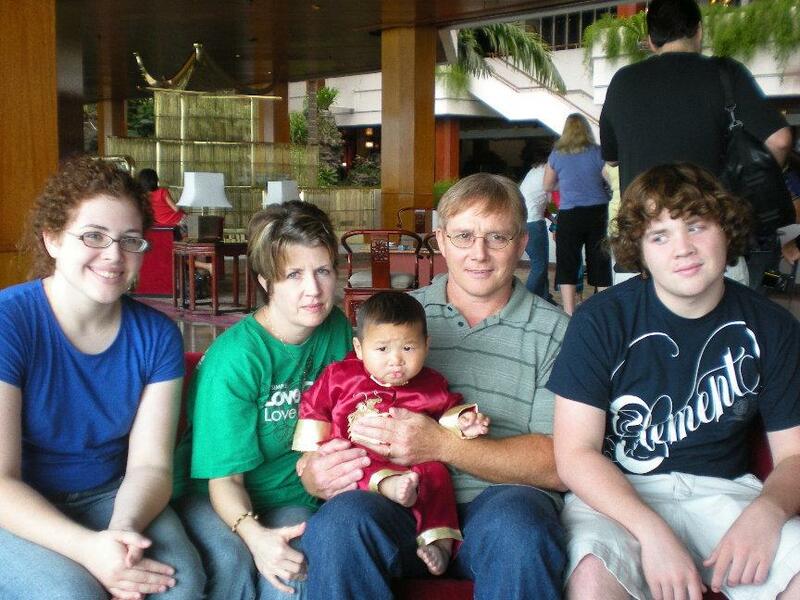 Glen and Colleen explained to PolkCountyToday.com that they had looked at several different countries when they decided to adopt a special needs child, but something kept pointing them back to China. Glen Goodwin is a DPS Trooper and wife Colleen works for a school. Together they've raised two children, so why adopt? Why China? Why a special needs child? Glen Goodwin and Elijah bonded quickly. "These are things we just felt led to do" says Glen. Anyone who knows Glen, knows where he's coming from. Glen is a man of few words but him and wife Colleen are actively involved in helping youth at their church. They're a couple who are ready and willing to give time and money in their cause of helping young people. Polk County is fortunate enough to have an abundance of great folks who get involved in helping in good causes; but adopting a special needs child from China? What about the expenses involved in such a long range deal? For starters, they had to add on to their modest home and built a new bedroom for Elijah. Not one to leave the kids out, the whole family made the excursion to China, the Goodwins flight expenses alone for traveling round trip to China on a two week venture exceeded $20,000. There's the medical expenses for a special needs child. 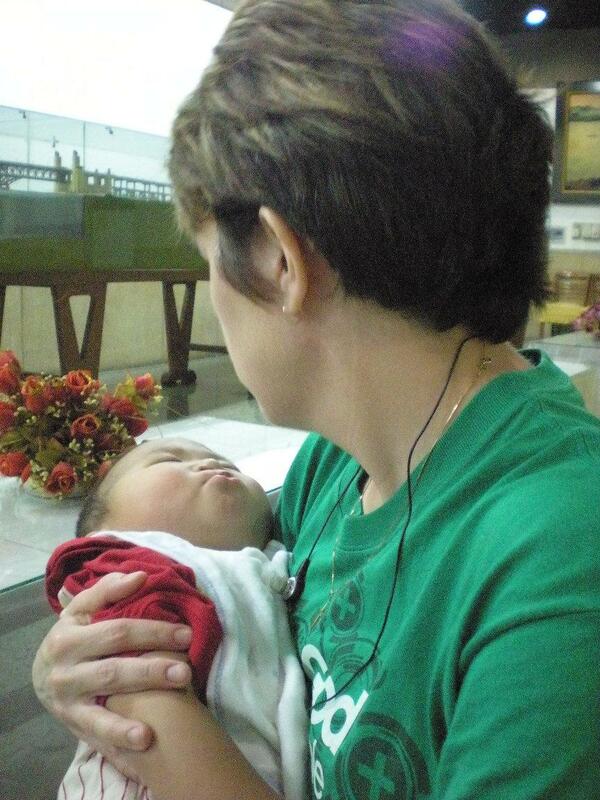 After several surgeries, Elijah's cleft lip is fixed but still has a cleft Palot (no roof of mouth). "We're getting that surgically fixed as well" Colleen says. According to the Goodwins, life in China isn't for the faint of heart. "It's so crowded that there's no time for compassion", Glen says. He continues, "If you see an old man struggling to get up some steps, people are too busy trying to get where they need to go than to stop and help another person in need". "They're too busy trying to survive". "It helps you appreciate just how good we have it over here in the USA" Colleen says. The Goodwins are situated on 4 acres in Big Sandy which is a far cry from the crowded streets of metro China. Elijah runs all over the house and has an ever present smile. It's easy to see that this child is as happy as a clam. He dropped into the Goodwin family, and seems to be fitting in quite well. Elijah clings to his new dad, Glen. All the time and expenses seemed to pale in comparison as I watched what was going on in front of me; a big happy baby that's been adopted into a better situation, and all the happiness and love that radiates. One can feel the joy in the room as this family of Glen, Colleen, Laurel, Jesse, and now Elijah, bond with eachother. Elijah will grow up with a Texas accent, learning how to hunt and fish, how to use a firearm properly, how to have compassion for others, a loving mother and father, freedom from an oppressive government, and a shot at a good education. Su Ding Tong, Happy Childhood. That's making the world a better place. "We plan on adopting again" Colleen says. Way to go Glen Goodwin and family! Like to help Chinese orphans but can't adopt? Visit www.chinacare.org for a ministry devoted to helping orphans, many with special medical needs. Elijah's happiness is easy to see.